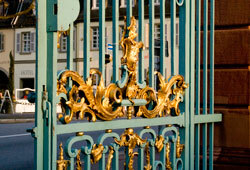 Schwetzingen is only a few kilometers away from Heidelberg and Mannheim. The good tram connections in the Rhein/Neckar Region mean that Schwetzingen can easily be reached by rail. The station is only 5 minutes away from the palace on foot. If you're coming by car, take the exit marked "Schwetzingen". Free entry with the Oberrheinischer Museum Pass! For guided tours you should call before the service center in Heidelberg. A lot of various themes and special group arrangements are available.